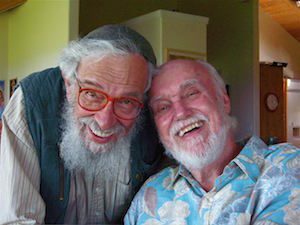 In a recent interview, the 85-year-old Ram Dass was asked this question: "Are you happy?" "I am joyous," he responded. "In this moment, I am joyous." Ah, yes.That's where it lives! It's crazy, right? Suffering lives where we don't! It lives in our regrets about that which we cannot change and in our fear of what is yet to come. When we stay where we actually exist - in the present moment - then joy is readily available to us in that breath we just took, in our hearts that continue to beat, in the sun that shines, in the miracle of smell and taste and touch, in the love we feel for others. Good news #1: Our chronic draw to living in the past and future (at the cost of the present) is nothing but a habit. It's an incredibly engrain habit, maybe even an addiction, but nonetheless a habit. And what we know is that old habits, even chronic old habits, fade when new habits take their place. Good news #2: This means that each time you choose joy in the present moment, even if only for a moment, you are building a new habit! What if just once a day, you consciously chose joy in the present moment - then milked it a bit to increase it's emotional "stickiness"? What if you increased that to twice a day? Or three times? There it sits. In the midst of suffering, joy is waiting to become a habit, and it takes only a minute or two each day. And in its infinite love and wisdom, the Universe feeds us an unending supply of reasons to be joyous. Let that sink in. So simple. So available. So powerful. In this moment, I am joyous.